Fat above eyes, has been overweight in past, no crest or other fat pads. Always starving. Lying down a lot. Depressed. Never had x-rays or blood tests. Confined on deep straw and rubber mats. Feeding 2kg soaked hay 4 x day using same water for 2 haynet soaks. Following weight loss, on advice of British feed company, feeding a high fibre cube containing 13.5% starch, plus alfalfa & a broad spectrum mineral supplement. Usually trimmed every 6-7 weeks but farrier hadn't been able to come for 9 weeks when these photos were taken (due to holiday). 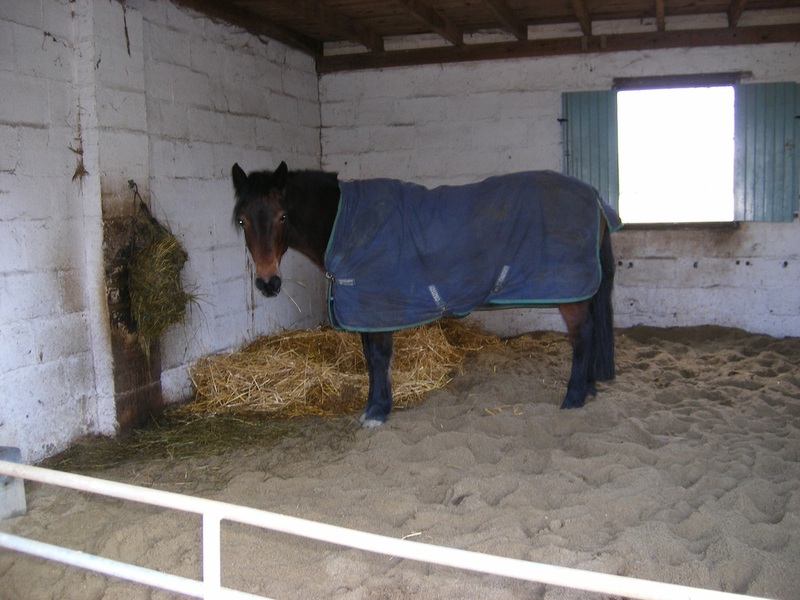 Sorrel's owner contacted The Laminitis Site at the end of December 2011, when Sorrel, a 14 yo Connemara mare, had laminitis in all 4 feet and could hardly move, despite pain relief. 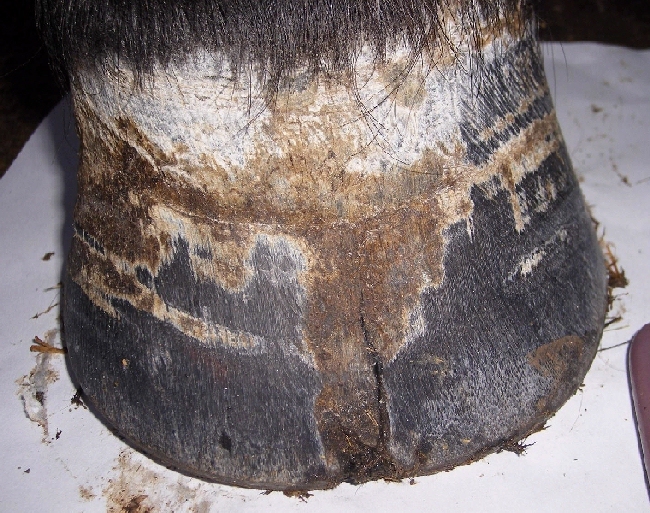 2004 (UK) first laminitis late summer aged 7, frequently “foot-sore” – put down to hard ground causing bruising. 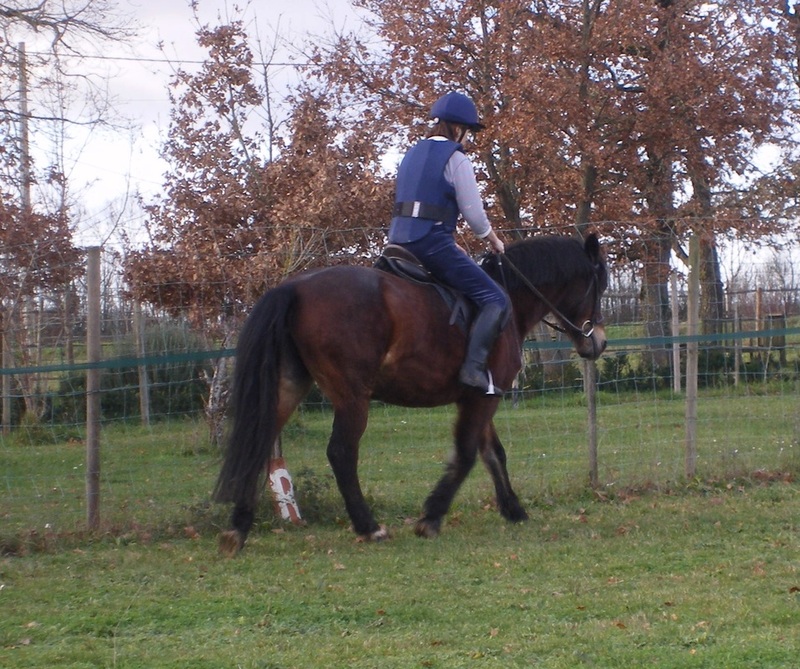 2008 (France) badly footsore, vet diagnosed laminitis and prescribed box rest, Bute and aspirin, and said don’t ride her for 9 months. 2010 ridden but laminitis later in year. 2011 chronic laminitis all year then acute particularly in left fore after chasing a stray sheep in her bare paddock at end of summer. Front feet: heels too high & therefore too far forward, frog not bearing weight, walls flared and too long, large toe cracks, deep black groove between wall and sole showing white line separation. Removed the 13.5% starch cubes and alfalfa from Sorrel's diet. Micronised linseed, low sugar chaff and Formula 4 Feet ordered. Fed at nose height to reduce load on front feet. Feeding 2% bodyweight hay soaked in fresh water every time, and hay sample to be sent off for analysis. Pads made from pipe insulation taped onto feet for instant relief, hoof boots ordered. Lorry load of sand put down in her huge stable, she was instantly more comfortable (area under hay net left clear of sand to avoid sand ingestion). During an intense cold spell her legs and feet were kept warm with leg warmers and she was well rugged. Companion nearby but unable to influence her movements. Insulin 21.3 µIU/ml (<20) & ACTH 10 pg/ml (<29). Glucose 84 mg/dl (<110). No evidence of PPID, assume insulin resistant but currently well controlled. X-rays of Sorrel's front feet in January revealed more damage than we had anticipated - which shows how essential it is to always get x-rays when a horse has had laminitis.The x-rays showed significant rotation in both front feet, toes far too long, significant laminar wedge, heels far too high, not much sole depth under P3, possibly slight sinking. No signs of recent damage so it seemed reasonable to presume that the damage had been there for some time with little being done to correct it, and that this had been causing Sorrel's long-term pain. The vet suggested 8 months of specialist farrier work, shoes & box rest. Our aim was to realign the hoof to the pedal bone (P3) as quickly as possible - just as if you break a leg, the bones should be realigned to their healthy pre-injury position. With laminitis you can't exactly move the bone, so you make changes to the hoof capsule which have the same effect as bringing the bone and foot back to its healthy pre-injury position, in time. Getting on with the realignment quickly is essential to prevent further damage, as is protecting the foot where necessary (boots and pads generally work well and allow access to the foot for frequent trims). Green – P3 with dorsal aspect projected to ground - breakover will be in front of this point. Yellow – slight sinking? - should correct as a new tight hoof wall is grown. 2. Rotate the x-ray to make the bottom of P3 (close to) ground parallel again. 3. Black out the areas we are going to trim/grow out to see how the new hoof will look. 4. 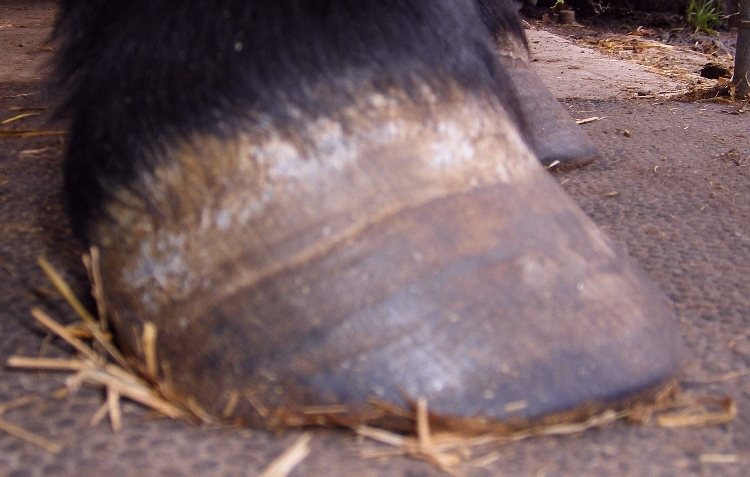 Apply the trim mark-up to a hoof photo (not so easy!). 5. Rotate and black out the same areas on the photo to see how the new hoof will look. After the 1st remedial trim the toe has been brought back but there is still heel and wall to remove. The back of the heel (red line) is still forward of the back of the frog (green line). reduce the heel (and therefore bar) height (red lines), never going into live sole and taking off no more than 1cm heel height in one trim (ideally frequent trims removing a small amount). reduce wall height and apply a strong bevel to the wall (red lines) to reduce separating forces on the walls/peripheral loading. retain some wall height at approx. 2 and 10 o'clock (orange) to protect P3 where the sole is thin & encourage the sole to thicken. The 2nd remedial trim removes most of the excess heel and wall, greatly improving Sorrels' comfort. The back of the heel (red line) is now pretty much in line with the back of the frog (green line), increasing the weight-bearing surface at the back of the foot. Armed with the information from the x-rays, Sorrel's farrier carried out a rather cautious first remedial trim, bringing the toe back so that the outer wall was no longer weight-bearing, but not taking much off of the heels. He returned 2 weeks later and spent a considerable amount of time going through all of the markups and trim suggestions, then worked on Sorrel's feet together with Sorrel's owner and made spectacular progress, beveling the flared walls so that they were no longer fully bearing weight, and bringing the heels down and back so that the frogs became weight-bearing, and significantly increasing the weight-bearing surface at the back of the feet. After the trim Sorrel's owner reported "she does not look lame at all - it's the first time I can remember that she actually looks ok."
Sorrel's new EasyCare Trail boots arrived for her front feet, fitted with pads and Sorrel was allowed to wander around the grass-free yard outside her stable for initially short but increasing periods. A third remedial trim 2 weeks later removed the last of the excess heel height and stretched white line. Sorrel was happy to have her feet picked up for the trim - this would have been unthinkable last time. It's now just a case of keeping the correct shape and waiting for a new hoof with strong laminar connections to grow down. Sorrel's owner is making a track around the outside of her large field, so that Sorrel can be near her field mate Hugo, to encourage her to keep moving and get plenty of exercise, but without eating excess grass. Sorrel is now going for walks with her boots on, and is so keen to come out into her little paddock that she picks up her feet herself when she hears the velcro on her boots being undone. "It all fits in now. I thought she had done something to her shoulder after she chased the stray sheep as she went lame on her left leg, corresponding as we now know to the rotation. I was just at wit’s end not knowing what to do to help her as I knew there was a problem but just did not know what. 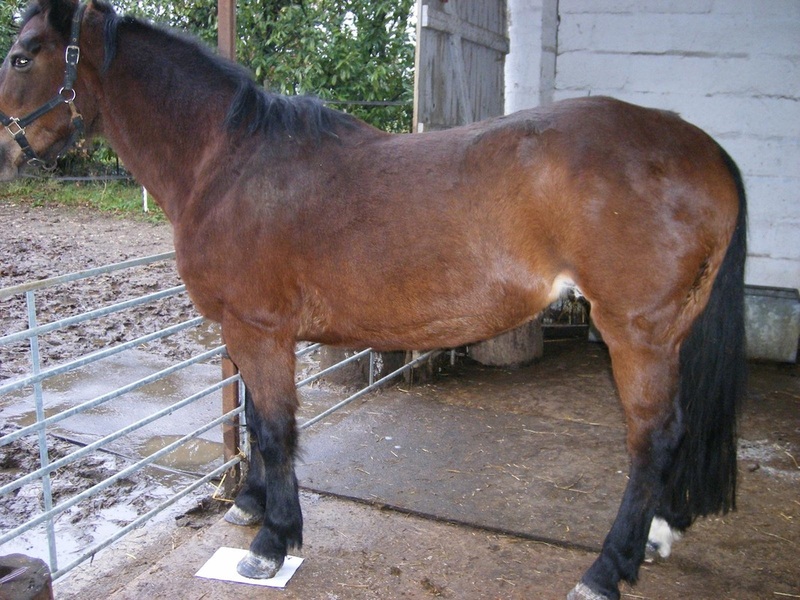 When we looked at her previous photographs it is obvious to us now that the damage caused in her feet by a laminitis attack some time in the past had not been picked up and corrected. I’m obsessed by looking at feet now! The message from Sorrel’s case history is definitely ‘’FEET CARE’’. In all the literature I looked at over the time when she was not well I just did not pick up on different methods of trimming for a laminitic pony." Sadly, not all farriers are experienced in rehabilitating chronic laminitis. But get x-rays, talk through the options with your farrier/trimmer, put the management changes in place, and you can often quickly turn a crippled horse into a happy horse with a good quality of life. The cause of Sorrel's laminitis, insulin resistance, has been diagnosed and treated with diet, and now exercise will help to increase her insulin sensitivity even more, so that hopefully she will soon be able to have some grass, initially on her track system and/or with a muzzle. Her feet have been fully supported and have been realigned as far as possible - now it's up to nature to finish the job as a healthy new hoof with tight laminar connections grows down from the coronet. A further set of x-rays will hopefully confirm this. Because Sorrel's laminitic episodes have often been in late summer/autumn, we have suggested that it might be worth testing ACTH again in the autumn, ideally September when ACTH levels are likely to be at their peak, and monitoring her insulin levels from time to time will also be a sensible precaution. Sorrel is making an excellent and speedy recovery, thanks to the commitment of her owners and the willingness of her farrier to take on new ideas. Their story is an inspiration, and we wish them well. Sorrel spent time throughout summer 2012 on her track with her mate Hugo. I met Sorrel for the first time in October, she looked fantastic, her feet were excellent, she had been doing lots of in-hand walking, so I encouraged her owners to start riding her again. Spring 2013 Sorrel continues to spend time on her track most days, she's working and showing no signs of laminitis - she's a pretty happy pony! Sorrel getting plenty of exercise and not much grass in her grazing muzzle on her track. July 2012 - a clear line on the hooves showing that the tight new growth is about half way. In November, 8 months after her realigning trim was pretty much in place, Sorrel was back in work. December 2012 - new healthy hooves - hurray!! Many thanks to everyone involved in Sorrel's rehabilitation, especially Liphook Equine Hospital Laboratory, Linda and others who offered advice at ECHoof & Barefoothorsecare. Please note the information given above is presented simply as a case study, it is not advice to be followed and does not represent trimming guidelines. We suggest that you always work with a qualified farrier/trimmer, that you always have x-rays taken after an episode of laminitis or if signs of laminitis are present in the feet, and we also suggest always getting an independent second opinion on laminitis rehabilitation footcare (see Support groups specifically for feet). 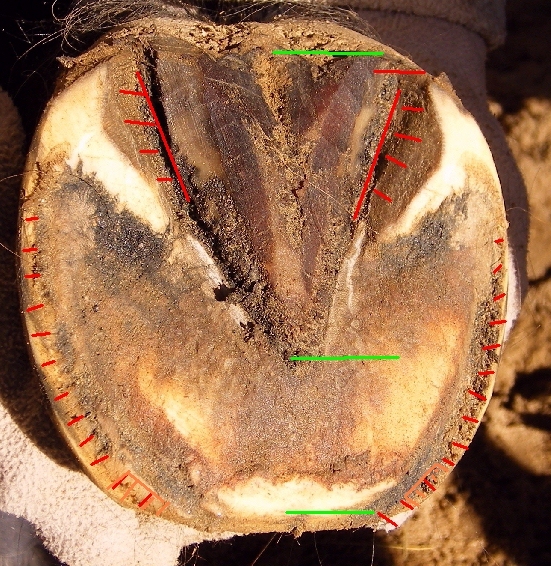 Every case of laminitis is unique, and what works for one horse may not work for another.